Now that our web site is up and running, we have switched to a blog format. This will be the last newsletter. From now on, you can visit WindyAcres.MyMiddleEarth.com for all riding club news. If you are looking for a specific article, look to the right-hand column of the page. You can read Recent Posts, select a Category, visit Quick Links, or use the Search box. Don’t forget to enter the Contest of the Month and vote in this week’s Poll. The Horse Name Generator has been upgraded! There are now over 1,000 names in several Middle Earth languages. All names that are not in English include a translation. The votes are in! 40% of visitors think the best feature of the “Riders of Rohan” expansion is warsteed cosmetics. 57% prefer pleasure riding in the Shire more than anywhere else in Eriador. 69% of you don’t plan to buy warsteed coats until they are much cheaper. 41% wish that palomino horses were available while 75% of you have a fast (+68%) steed. The Steed of the Hunter came out on top with 75% of the votes. Perhaps most surprising, 27% of you have more than 40 horses in your stable! The racing season is in full swing. 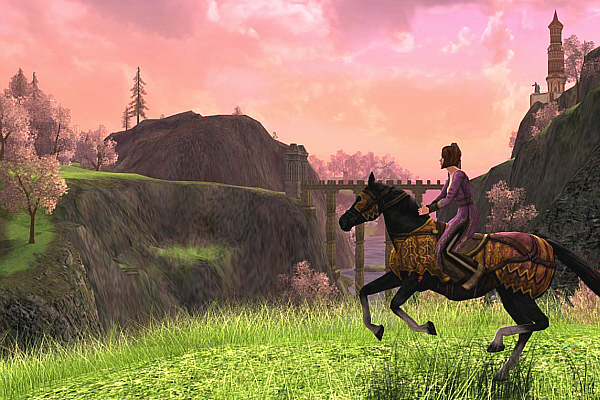 In August, jockeys gathered in Tinnudir, Evendim for the High King’s Challenge. Anidore, Anthemisi and Hrothelm won the horse show. Craicwyth, Andeon and Apothecary won the race. Later that same month, we traveled to the Forsaken Inn in the Lone-lands for the Rivendell Challenge, a cross-country endurance race. Elyariel, Dannigan and Trignee won the horse show. Byrcha, Limilniel and Judgejoako won the race. September was a popular racing month and a large crowd gathered for the Shadowfax Sprint near Tuckborough. Lifebringer, Artemieth and Beorbrand won the horse race. Carica, Artemieth and Godwineson won the talent show. Lifebringer and Carica received an epic prize – the Legendary edition of the “Riders of Rohan” expansion. The Windy Acres Ranch formation riding team performed a demonstration and horse parade at Ales and Tales in early October. The Argent unit rode in a spectacular performance with music provided by Old Winyards. Alinniel, Tinki and Laval won the horse show. The Haunted Derby in mid-October challenged riders to make their way through the mysterious Old Forest, survive the dangers of the Barrow-downs, and return to Buckland Faire. Fleam, Elyita and Clairawyn won the costume contest. Andeon, Craicwyth and Byrcha won the horse race. At the end of October, revellers gathered at Windy Acres Ranch for the Wraith Race. The costume contest had the theme “Ring Wraiths” and only the riders with the best nine costumes were allowed to race. Mornareth, Beorbrand and Belegfeld won the costume contest. Anthemisi, Craicwyth, Calebus, Gwadreodewyn, Elydric and Caiyyd were also nominated as excellent wraiths. Craicwyth, Godwineson and Calebus won the race. The big event for November was the Second Annual Turkey Chase. Jralyn brought her bay horse Dasher across the finish line first, followed by Riani on Yabrecht and Caiyyd on Sovvan. A wonderful crowd turned out for the horse show at the ranch. Betrus, Laval, Oakfen, Belmae and Calebus had brilliant outfits. First place and 500 TP went to Caiyyd, second place to Elyadia, and third place to Riani. Here is the complete list of tips from all twenty newsletters. Read the rules and review the maps for horse races at the Windy Acres Ranch web site ahead of time. Show up early to every race. This will give you time to confirm your registration. It will also allow time to fend off any pre-race jitters. When you arrive at the race site, make sure that you can see and hear the race master. If not, you might be playing on a different dynamic layer. Join a fellowship with a race official. Once in the fellowship, you can transfer to the same layer by clicking on the Dynamic Layer Alert in the lower right hand corner of your screen. Voice chat is not a reliable way to communicate during races. If you have something to say to the race master or a judge, use /tell. If you don’t get a response within a few minutes, send the /tell again in case your original message was lost in spam. Please be patient – race officials are asked a tremendous number of questions before a race. You must join a raid group to participate in a race. If you are in a fellowship when you arrive, leave it. To make sure the race master can invite you, go to System…. Options… Social Options and check “Enable Fellowship Requests”. Use /ra instead of /f if you want to ask a question in the racing raid group. /f cannot be heard by all members of the raid. During the pace run of any race, if you have questions about the course, make sure to ask the judges. Don’t miss an important shortcut because you were afraid to ask a question. When in doubt, ask! At a horse race, a tune known as the “First Call” or “Call to the Post” is a signal that all mounts should be positioned at the starting line because the race is about to begin. Click here to hear the call. If you see someone cheating, take a screenshot. Notify the judges the moment the race ends. Be prepared to email the screenshot to a judge. If you find a special path between checkpoints when training for a race, do not follow this path during the pace run. Other riders will notice and discover your secret route. If you are one of the first three riders to cross the finish line, meet the race organizer after the prizes have been handed out to participate in the winner’s screenshots. Check your rider standings and make sure they are correct. Some races only allow previous winners to participate. Don’t try to correct an error at the last minute. Next time you visit Bree-land homesteads, add the Raglan neighborhood to your list of favorites. This will make it easier to reach Windy Acres Ranch for special events. Make sure that you have secure trade enabled if you win a race. Otherwise, the race master won’t be able to give you a prize. Go to System… Options… Social Options and check “Enable Secure Trade”. If you have a Free To Play account, make sure that you have removed your Currency Cap before the race. If you win, you will want to be able to hold more than 5 gold in your wallet. The currency cap can be removed for 395 Turbine Points in the store. If you win a code for a mount or cosmetic item, you must log in at MyAccount.Turbine.com and enter it as a Product Key to activate it. Logging in to My.Lotro.com will not work for these codes. If you win a Turbine Point code, click the Store button, click “Add Points”, enter the code where it says “Redeem Points Card” and click “Redeem Now”. The points will be available to all characters on your account. If you win a code at a race, enter it right away, before you leave. The longer you wait to report a problem, the less likely it will be that your event host can solve it. Your first horse will cost 500 silver and all regular horses cost 220 silver thereafter. Festival horses cost the same amount. Faction horses, which require kindred standing with the appropriate group, cost almost 5 gold each. You can also buy a grey horse or pony after completing the Volume 1 epic quests for 5 gold, 64 silver. Many races allow betting. Look at the list of riders signed up for the race and decide who you think will win. Place your bet by sending a /tell to the bookie with that name. Not sure who to bet on? Go to the race course several hours before the race. See if any riders are practicing. They are more likely to win. Check the Rider Standings for betting tips. When many people bet on the same rider, each person’s chance of winning is low. You will win more often if you bet on a second or third rank rider. Look for riders who have some experience but a relatively low score. Make sure that you are in “run mode” and ready to gallop when you are called to the start line. After you are in the proper position at the start line, turn your mount towards the first checkpoint. When the race is about to start, put your finger on the button (keyboard or mouse). When you notice the signal that starts the race, run! Don’t wait for everyone else to dash out ahead of you. Have confidence that you won’t make a false start. According to veteran riders, spurring your horse with a key-press (W or NumLock) is a safer way to begin the race than a mouse-click of both buttons. If you see, hear, or read the signal to start a race, gallop immediately. You might not notice all of them. Try to see the animation, hear the sound effect, and read the text in the chat log. Have faith in yourself. Don’t pan the camera around to check on other racers. You may miss a turn or overlook an obstacle. Pay attention to your horse and the course. Pretend you are the only one on the track. The shortest distance between two points is a straight line. Don’t race down the middle of a road. Hug the inside of curves closely. Make sharp turns. Landmarks will help you ride in the right direction, especially during steeplechases, but only if you can see them. Adjust your “Object Draw Distance” and “Landscape Draw Distance” to the highest possible settings. You may also need to increase your “Distant Imposters” setting. Decrease all other graphical settings to their lowest possible level. Familiarity breeds success. Whenever possible, visit the race track ahead of time and practice running the course. Make careful note of which angle to come out of turns to aim directly for the next checkpoint or obstacle (they won’t always be within view or “drawing distance” for your video card). Find all legal shortcuts. Jumping significantly slows your horse for a full second. A small detour is faster than an extra jump. Easy on the spurs! Be frugal with the space bar. Don’t spam it or your horse may get confused and miss a jump entirely. There are two ways to jump. You can tap the space bar for a short leap and hold it down for a long jump. Jumping is slower than galloping, so use the short leap whenever possible. Your horse needs a full stride between jumps. If you are approaching two obstacles which are positioned close together, jump as early as possible over the first one. This will give you a little extra time and distance to prepare for the next jump. You can turn in mid-air during a jump. Turn toward the next checkpoint mid-leap so that your horse is running in the right direction the moment his hooves hit the ground. Whenever you are jumping an obstacle while racing uphill, you will have to jump as late as possible to compensate for the angle. When you are jumping over an obstacle with a steep slope on the other side, jump as early as possible to reduce the risk of a sprained leg and several seconds of critical slow speed. If you can’t avoid the cliff, turn toward it and run forward as you fall. Not all walls and fences are equal. Most of them have a low point which is easier to jump. This is especially important for stone walls on uneven terrain. Look for a dip right at or directly between two pillars. If the race course includes steep jumps, practice them ahead of time. Find out how far you can jump before spraining a leg and taking a speed penalty. Look for small ledges that you can tap on your way down an incline to reset your falling distance. Turning toward a cliff as you fall will often reduce the chances of a sprained leg. Do not jump when passing a checkpoint or crossing the finish line unless it is absolutely necessary. Your floating name may not appear clearly in screenshots taken by the judges, who must confirm that you made a legal run. The best way to turn a corner on a standard mount is to use your camera for a “snap turn”. Snap turns are faster and more accurate than turns made using the arrow keys or WASD buttons. There are several ways to make this turn using your mouse and keyboard. Here is one example. Use NumLock to keep your horse running toward the next turn. Hold down your left mouse button and pan the camera around to face the direction you want to run after the turn. Just as your mount clears the obstacle at the checkpoint, click your right mouse button. You will immediately be facing the direction that the camera was pointing. You may need to hold down both mouse buttons to prevent your mount from stopping. If you have trouble navigating an obstacle, don’t give up. The riders ahead of you may run into trouble before the finish line. Know your depth. Discover how much water your horse can run through before dismounting you. If you’re thrown from your horse, you have lost the race. Hobbits and Dwarves need to be especially careful around water. Make remounting faster and easier by adding a button for the correct mount to one of your quickslot bars. Go to System… Options… Quickslots to configure your bars. Go to the Mounts tab of the Skills window to find your list of available mounts. If you are dismounted during a race, be careful to continue with the same horse that you started with. Turning off floating names can give you a clearer view of obstacles on the track. Press “N” to toggle floating names. Think you’re winning the race, but it’s close? Take a screenshot of yourself crossing the finish line. Offer to email it to the judges immediately if there is any controversy. Pan overhead. When crossing narrow terrain, position your camera view more overhead than behind. This will give you a more accurate view of where your horse’s hooves are landing. If you are suffering from terrible lag and can’t seem to leap across the water obstacle on the festival race course, take the low road. As long as you keep to the inside of the track and make clean jumps, you can win the race even if you are bogged down by both sticky mires. If you are galloping toward multiple jumps that are very close together, don’t take them straight on. Your steed will need a full stride between jumps. He will need even more room if he is running faster than normal. If you don’t give him enough room, your steed will balk or catch a hoof on the obstacle. Go through the obstacles in a zig-zag pattern. Take the first jump at a right angle, the second at a left angle, the third at a right angle, and so on. This will give your steed an extra half a second to find his footing. When participating in festival races, if you fall off of the boards into the sticky mire, don’t go back and try again. Continue forward at the slower pace. If you have done well on the rest of the course, you can still win even if you bog down at both crossings. Avoid using a wireless connection to the internet during races. Using an ethernet cable will reduce your lag. To decrease lag, unload all game plugins that you are not using before a race. Go to System… Plugin Manager to configure your plugins. Shut down all programs except for LotRO. Make sure that your computer will not defragment the hard drive or scan for viruses during the event. Disable voice chat if you are not using it for the race. An ugly race is a fast race. Turn down your graphics settings, stop any other network traffic (close Hulu, Facebook, MyLotro, etc) and do everything else you can to reduce lag. You can take pretty screenshots of yourself and your horse after you win. Make sure that you have correct and updated drivers for your video card and monitor. This will help graphical performance and reduce lag during races. Do not wear hats, cloaks, packs or weapons while racing. These items make it more difficult for the finish line judge to evaluate your position. Clear your active title before the race. This will help the course judges see your name clearly in screenshots. Go to the Character tab (C), click Title, and then click Clear Active. You can also hide your Rank and Surname. Look for “Show Rank” and “Show Surname” at the top of the dialog window and uncheck them. Wear a distinctive outfit at the race. Try to ride a horse that none of the other riders have selected. This will make it easier for the judges to identify you in a “photo finish”. If you have multiple cosmetic slots, use them to your advantage. Put the same outfit in a different color in every slot. If you arrive at the race and notice another rider wearing the same color, you can switch without going back to the bank. Need a quick and easy riding shirt? Check out Cotton Armour (lvl 22+, tailor-made) and Shining Padded Jacket (lvl 21+). These look a lot like a jockey’s shirt, especially when dyed in a bright color. Quilted Armor (lvl 14+, tailor-crafted) also makes a fairly good riding shirt. Want to avoid embarrassing saddle bounce? Press the Insert key twice while galloping to make sure that you are in sync with your horse before the race begins. Taking screenshots of a race? Consider turning off graphical elements that detract from realism. Go to System… Options… UI Settings. Uncheck “My Character’s Name”, “My Fellows’ Names”, “All Player Names”, “Show Rank”, “Show Surname”, “Item Names”, “NPC Names”, “Player Titles”, “Player Kinships”, “Overhead Quest Icons”, “Overhead Non-Quest Icons”, and “Chat Bubbles”. To hide the user interface during screenshots, press the F12 key. Press it again to make the interface return. Roleplay from horseback! You can play music while mounted. You can also use the following emotes with animations – Bother, Bye, Calm, Cheer, Cry, Drink, Eat, Fidget, Firebreath, Followme, Hail, Laugh, Look, Lookaround, Munch, Roar, Salute, Shakefist, Swordsalute, Think and Wave. You can also purchase three horse emotes in the store – Mountbow, Mountkick and Mountrearup. Bring musical instruments, fireworks, drinks and pipe-weed for the post-race party. A horse giving his utmost effort is “all out”. The term “also ran” applies to any horses who are not among the first four to cross the finish line. A “bald” horse has a white face, including the eyes, and all or part of the nostrils. When an inexperienced rider deviates from a straight line course between two checkpoints, it is called “bearing in” or “bearing out”. A “blaze” is a white patch on the horse’s face. “Blinkers” are a common piece of equestrian equipment that blocks the side and rear vision of the horse. The “bridle” is a piece of leather gear which fits on a horse’s head and is where other equipment, such as a bit and the reins, are attached. A “caparison” is a large covering or blanket laid over a horse’s back and neck, often bearing heraldry. A horse who runs best in the latter part of the race is a “closer”. A horse is “cut down” when it is injured by the hooves of another horse, or by its own hooves if it has a bad stride. A “dark horse” is a horse whose capabilities and chances of success are not yet known. When two horses cross the finish line at the same time, it is a “dead heat”. A rider pushing his horse to run faster is “driving” him. A horse “dwelt” if he hesitated when the race start signal was given. A horse forced to run at top speed is “extended”. A horse has “faltered” when he drops back significantly toward the end of the race. A “farrier” is a blacksmith specializing in shoeing horses. In the early days, he was also a horse healer. A “flat race” is a course without obstacles such as hedges or fences. A “heat” is a race in which more than one running is required to determine the winner. A “morning glory” is a horse that runs well in workouts but fails to perform well in races. The “post” is the starting point for a race. “Post time” is the designated time for a race to start. A “scratch” refers to a horse and jockey who signed up for the race but dropped out before it began. A horse that begins to run less aggressively has “spit the bit”, backing off of the pull a rider normally feels on the reins from an eager horse. “Tack” refers to the saddle and other equipment worn by a horse during racing. A “weakened” horse loses ground toward the end of the race.